This rental agreement is made on the ____day of ______2013, between __Southridge RV Park , with its principal office located at 1425 Turtle Creek, Lufkin, Texas 75904, referred to herein as Lessor, and (Lessee-Guest) referred to herein as Lessee. Rent: Lessee agrees to pay as rental $ _____ /monthly for RV spot(s) beginning_____________, 2013 through _______ payable without demand, either by credit card or check on ___1st__ of each month. Utilities/Cleaning: Lessor shall pay for all water, electricity, cable, and internet and other utilities supplied. Assignment and Subletting: Lessee shall not sublet the RV spots, or any part of the Premises, or assign this agreement without Lessor’s prior, express, and written consent. Default: Any failure by Lessee to pay rent or other charges promptly when due or to comply with any other term or condition of this agreement shall, at the option of Lessor, promptly terminate this tenancy and forfeit all rights of Lessee under this agreement. Maintenance and Redelivery of RV Spot: Lessee shall keep and maintain the RV Spot in a clean and sanitary condition at all times, and on the expiration or earlier termination of the tenancy shall surrender the RV Spot to Lessor in as good condition as when received, ordinary wear and tear and damage by the elements excepted. Effect of Holding Over: The parties agree that any holding over by Lessee under this agreement, without Lessor’s written consent, shall be a tenancy at will which may be terminated by Lessor in accordance with applicable law. Indemnification: Lessee shall indemnify, defend, and hold Lessor harmless from any and all claims and damages (including reasonable attorney’s fees and costs) arising from Lessee’s use of the RV Spot or from any activity permitted by Lessee in or about the RV Spot unless caused by the gross negligence or willful misconduct of Lessor. Lessee shall further indemnify, defend, and hold Lessor harmless from any and all claims and damages (including reasonable attorney’s fees and costs) arising from any breach or default in the terms of this agreement or arising from any act, negligence, fault, or omission of Lessee and from and against any and all costs, reasonable attorney’s fees, expenses, and liabilities incurred on or about such claim or any action or proceeding brought on such claim. In case any action or proceeding shall be brought against Lessor by reason of any such claim, Lessee, on notice from Lessor, shall defend it at Lessee’s expense by counsel approved in writing by Lessor. Mandatory Arbitration: Any dispute under this agreement shall be required to be resolved by binding arbitration of the parties hereto. If the parties cannot agree on an arbitrator, each party shall select one arbitrator and both arbitrators shall then select a third. The third arbitrator so selected shall arbitrate said dispute. The arbitration shall be governed by the rules of the American Arbitration Association then in force and effect. Governing Law: This agreement shall be governed by, construed, and enforced in accordance with the laws of the state of Texas. Waivers: Waiver by Lessor of any breach of any covenant or duty of Lessee under this agreement is not a waiver of a breach of any other covenant or duty of Lessee, or of any subsequent breach of the same covenant or duty. Counterparts: If this agreement is executed in multiple counterparts, all counterparts taken together constitute this agreement. Copies of signatures to this agreement are effective as original signatures. QUIET TIME: 10 p.m. / 7 a.m. – please be considerate of others. No loud music at any time. CHECK-OUT TIME IS 1:00 P.M.-Due to previous reservations, if you plan on staying longer, the earlier you re-register, the better your chance of keeping your site. SPEED LIMIT: Please observe a speed limit of no more than 5 mph. SEWER: Sewer connection – a positive sewer seal at both ends of sewer hose is required. Texas law requires that a sewer hose must be fastened using a connector or a rubber donut. CHILDREN: We want the children to be safe & have a good time, but always under the watchful eyes of a parent/guardian. Please use good judgement if you decide to leave your children at the park when you are gone. We are not responsible for their safety or welfare. You are liable for their behavior. PETS: Please maintain control of your pets. The limit is for only 2 pets allowed on leash. Owners must clean up after their pets. Do not leave pets tethered on a leash or chain or in a pen outside overnight or when you are absent. Absolutely no pets other than service animals are allowed in the office or laundry! The same rules apply for cats as for dogs. Cats are inside pets only. If outside, they must be on a leash with the owner at all times. These rules are for health reasons as well as the respect for others. NO AGGRESSIVE BREED DOGS ARE ALLOWED IN THE PARK. TRASH: Dumpster located in the park is for personal trash only. All garbage must be bagged & tied, boxes broken down. DO NOT leave trash outside by your RV. Cleanliness of the park is important to us. Sites are to be kept clean and orderly, as determined by management. Please leave laundry as you would like to find them. If they are in need of attention, please notify the manager. Washing vehicles in the park is prohibited, however; keeping your RV clean and in good repair is required. Internet: Wireless Internet is for our guests. 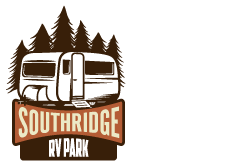 Southridge RV Park is not responsible for the operations of this Service. For problems contact: Tengo Internet at (866) 968-3646. NO FIREWORKS ALLOWED. NO OPEN FIREARMS DISPLAYED. PARKING: Two vehicles only per RV space if your space is large enough. Please park parallel to your RV out of the main drives. CLOTHS LINES ARE NOT ALLOWED. ELECTRIC SPACE HEATERS ARE NOT ALLOWED. NO CHEATER BOXES OR PIGTAILS ALLOWED. Southridge RV Park is not responsible for any electrical components on RV’s. CONDUCT: Disorderly conduct, drunkenness, illegal drugs, obscene language, obnoxious, disruptive or vulgar behavior will not be tolerated. They will be reason for immediate eviction without refund. DRUGS: Illegal drugs of any form are prohibited on the property of Southridge RV Park. Person(s) caught in violation of this rule are subject to immediate eviction without a refund. Person (s) knowing of any illegal activity are encouraged to notify the management immediately. Any information reported will be strictly confidential. LIABILITY: All park facilities and equipment of the park is intended for the convenience of the guests. Any and all persons using the facilities do at THEIR OWN RISK and consent. The park management is NOT RESPONSIBLE for accident due to fire, theft, wind, flood, personal negligence, acts of God or other unfortunate circumstances. The registered guest is financially responsible for all individuals or pets at their site for any/all damage to the park. These rules are for health, cleanliness, legality and welfare of all. MANAGEMENT RESERVES THE RIGHT TO EVICT OR REFUSE SERVICE TO ANY PERSON OR PERSONS WHO BREAK OR DISREGARD ANY RULES WITHOUT REFUND. MANANGEMENT RESERVES THE RIGHT TO REFUSE ANYONE. MANAGEMENT RESERVES THE RIGHT TO MAKE CHANGES TO THE RULES, REGULATIONS AND FEES WHEN NECESSARY. We know most RV’ers to be some of the most helpful, honest and kind people in the world with good common sense, needing no written rules as they already honor the welfare and rights of others. These rules are to guide those who do not yet respect the property and rights of others. THIS PROPERTY IS UNDER 24 HOUR VIDEO SURVEILLANCE. EQUIPMENT IN USE IS TO AID IN THE PROSECUTION OF ANY CRIMES COMMITTED AGAINST THIS BUSINESS.